You may have missed houseplant appreciation day, but residents at Lymewood Court certainly didn’t! The green-fingered people at Lymewood Court recently took part to celebrate the national day. Staff brought in their own houseplants for residents to water, prune and take care of. The plants provided an excellent way for residents to start conversations and discuss with one another, finding out about the different plants and talking about their own gardens was both a great nostalgia session and very educational. 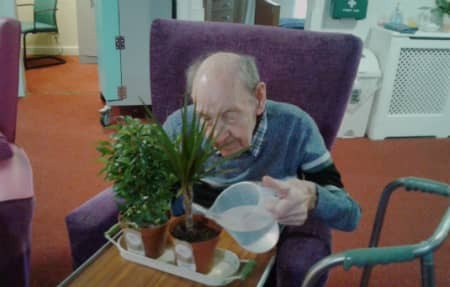 “It was also a sensory experience as the feel and smells of the plants provoked reactions and conversation”, commented Louise Mitchell, Activity Coordinator at Lymewood Court. After the success of the day, Lymewood Court have decided to create an indoor garden for the residents and grow their own plants and herbs, a project that many of the residents are excited to start.